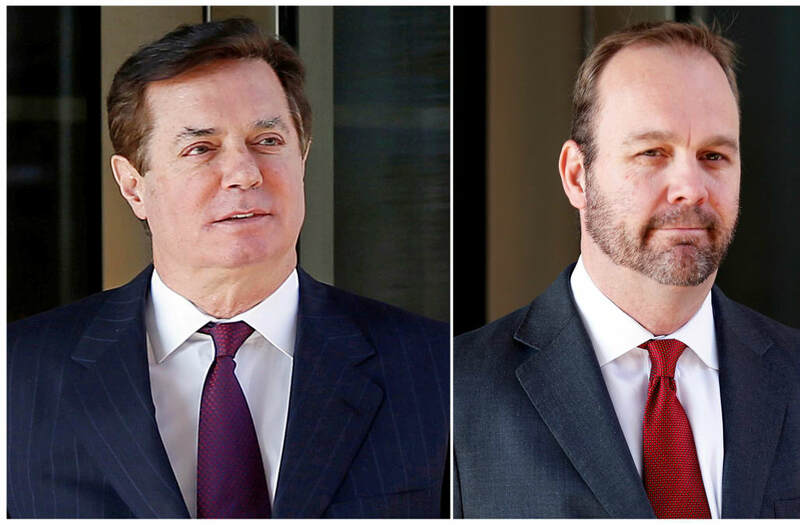 ALEXANDRIA, Va. (AP) — Paul Manafort's longtime deputy told jurors Tuesday how he spent years disguising millions of dollars in foreign income as loans to lower the former Trump campaign chairman's tax bill. Rick Gates, the government's star witness, recounted how he and Manafort used offshore shell companies and bank accounts in Cyprus to funnel the money, all while concealing the accounts and the income from the IRS. "In Cyprus, they were documented as loans. In reality, it was basically money moving between accounts," Gates said during his second day of testimony in the financial fraud trial of his former boss. Prosecutors summoned Gates, described by witnesses as Manafort's "right-hand man," to give jurors the first-hand account of a co-conspirator they say helped Manafort carry out an elaborate offshore tax-evasion and bank fraud scheme. Manafort's defense attorneys have sought to paint Gates as an embezzler, liar and the instigator of any criminal conduct. They have several times tried to impugn his credibility before the jury. Manafort and Gates were the first two people indicted in special counsel Robert Mueller's investigation into potential ties between Russia and the Trump campaign. But Gates pleaded guilty months later and agreed to cooperate in Mueller's investigation of Manafort, the only American charged by the special counsel to opt for trial instead of a guilty plea. In a reflection of Gates' importance to the prosecution's case, a cart of about a half dozen green-and-white document boxes bearing his name was rolled into the courtroom ahead of his testimony. Gates laid responsibility squarely at Manafort's feet, bolstering the prosecution's case that Manafort was in full control of his finances and directing Gates' actions. He recounted how Manafort negotiated the offshore payment structure in person with Ukrainian oligarchs, and then Gates would then codify the details in writing. Gates also described to jurors how he repeatedly submitted fake financial documents at Manafort's behest as his former boss became concerned he was paying too much in taxes and, later, that his funds were drying up. In one note read to the jury, Gates says Manafort wrote "WTF" and "not happy" about tax payments he was going to have to make. Gates repeatedly acknowledged his role in deceiving tax preparers, banks and other financial professionals about Manafort's finances. In one instance, he acknowledged having produced a fake loan forgiveness letter between Manafort's consulting company and a Cypriot entity he controlled. Prosecutor Greg Andres pointed out that he had created a "loan forgiveness letter between Mr. Manafort and Mr. Manafort." When the trial broke for lunch Tuesday, Manafort looked back at his wife, sitting in the front row, smiled and winked at her, followed by a quick shake of his head, seeming to indicate he was unfazed or unbothered by the morning's testimony. Gates has read off the names of more than a dozen shell companies he and Manafort set up in Cyprus, St. Vincent and the Grenadines and the United Kingdom to stash the proceeds of Manafort's Ukrainian political consulting work. Gates, who is awaiting sentencing, told jurors that he siphoned off the money without Manafort's knowledge by filing false expense reports. He also committed credit card and mortgage fraud, falsified a letter for a colleague involved in an investment deal and made false statements in a deposition at Manafort's direction. The case against Manafort has nothing to do with either man's work for the Trump campaign and there's been no discussion during the trial about whether the Trump campaign coordinated with Russia — the central question Mueller's team has tried to answer. But Trump has shown interest in the proceedings, tweeting support for Manafort and suggesting he has been treated worse than gangster Al Capone.